On Truth & Reality: Philosophy Physics Metaphysics of Space, Wave Structure of Matter. Famous Science Art Quotes. And those whose hearts are fixed on Reality itself deserve the title of Philosophers. (the most widespread occupational disease of the professional philosopher). The resistance to new ideas increases by the square of their importance. This website is about truth and reality - about how you and everything around you exist in space. We have an extensive collection of pages on many of the greatest minds from history, with thousands of brilliant quotes that are both inspiring and profoundly important. More than this though, we provide a simple solution to many of the problems of knowledge that have caused humanity so much conflict and confusion. And yes, we do realise that people are skeptical of websites on truth and reality. But the solution is obvious once known - it just takes our minds a while to adjust to new ways of thinking. For the past 350 years (since Newton) we have tried to describe an interconnected reality (which has been known for thousands of years) with many discrete and separate 'particles'. Thus you have to add forces or fields to the particles to connect them together in space and time. This is merely a mathematical solution and it does not explain how discrete matter particles create continuous fields that act on other particles in the space around them. Further, both quantum physics (particle-wave duality, non-locality, uncertainty) and Einstein's general relativity (matter-energy curves space-time) contradict the concept of discrete and separate 'particles'. We simply needed to describe reality from the most simple foundation of the one thing, Space, that all matter exists in (look around you now and think about this - we all experience existing in space). This leads to only one solution, a Wave Structure of Matter in Space from which we then deduce the fundamentals of physics, philosophy and metaphysics to show that it is correct (and scientific / testable, not just our opinion). Fig. 1: There is no particle-wave duality of matter, just a spherical standing wave structure of matter where the wave center creates the 'particle' effect, and the spherical in and out waves provide continual two way communication with all other matter in the universe. We only see the high wave amplitude wave-center and have been deluded into thinking matter was made of tiny little 'particles'. A very naive conception in hindsight - and quantum physics was telling us all along that waves were central to light and matter interactions! There are just two steps to deducing the truth about your existence in the universe. And I emphasize that none of this is my opinion - everyone will come to the same conclusions since it is deduced. So now we are considering the properties of this space to explain activity / motion. Look around you in space and notice that light comes in to you from all directions. This light has well known discrete ‘particle’ and continuous wave properties (the famous particle-wave duality of both light and matter). However, we cannot add discrete and separate particles to space (a second substance is not allowed) but we can have space vibrating (a property of space as a wave medium). Thus we come to the necessary conclusion that this one substance must be space, and this space must have waves flowing through it in all directions (since we can see things in all directions). Finally, we must consider what kind of waves can flow in all directions through three dimensional space. We find the most simple solution is two dimensional plane waves moving in the third dimension. So let us now simply state our conclusion - our truth statement for what exists. One Active Substance (Three Dimensional Space) Exists and has Plane Waves Flowing Through it in All Directions. This is the most simple way to describe physical reality that is in harmony with science and metaphysics - and it is a valid scientific model that can be mathematically treated to make testable predictions. Fortunately for us, a brilliant philosopher, metaphysicist and mathematician, Sir William Rowan Hamilton (1843) invented quaternions, a three dimensional algebra that does exactly this - they represent the motion of real things in real three dimensional space. Hamilton believed this mathematics was special and would be important to physics (he carved it on a stone bridge, as he was walking when he thought of it and did not want to forget!). It is beautifully elegant mathematics that perhaps scares off many people because of its use of imaginary numbers i, j, k. But these just represent 90 degree rotations. Thus i2 = -1 really means a 180 degree rotation which reverses an object's direction, hence the negative sign. So whenever you see ix, jy and kz you are considering vectors on orthogonal planes (90 degrees, perpendicular, at right angles) to the x, y and z axis. This then gives us the four dimensional mathematical structure to represent plane waves flowing through 3D space. So now we are in a position to test this wave theory of reality to see if it correctly deduces the properties of matter that we observe in the space around us. And now for the very cool clever bit - it is these waves that create both matter 'particles' and fields! i.e. When you do the mathematics (complex quaternion wave functions) you discover that space actually vibrates in two completely different ways depending upon the phase of the intersecting plane waves - and these two modes of vibration exactly deduce both the quantum field (backgound space) and matter 'particles'. BACKGROUND SPACE FIELD VIBRATIONS - Space vibrates in a fixed (but very complex) vector / transverse wave pattern in all directions. 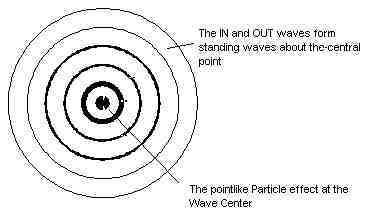 PARTICLE VIBRATIONS (ELECTRONS & POSITRONS) - Space vibrates spherically around a central point - a scalar longitudinal spherical standing wave. Of profound importance though is the fact that there are exactly four unique phase arrangements of the plane waves such that all the vector / transverse wave components cancel one another and you are left with this scalar / longitudinal spherical standing wave (space vibrates radially in and out around a central point). Two of these phase arrangements create the two spin states of electrons, and two phase arrangements create the two spin states of the opposite phase standing waves, positrons (anti-matter). This keeps the phase of electrons and positrons locked to the phase of background space (which is the same everywhere) thus explaining how these wave-center 'particles' are locked in their respective phase relations with one another across the universe (what I was seeking). This simple diagram represents intersecting plane waves. When you combine the top eight diagrams you get the image below. You can clearly see the spherical effects starting to form (circles in 2D, you must imagine it in 3D) - and importantly you also see opposite phases (positrons and electrons) being formed. We have a page of wave diagrams that will help you visualize the spherical standing wave structure of matter (WSM) in space. However if you want to see and use these 'particles' then you need to add energy to them to separate them (before they annihilate / switch back to the quantum field vibratory pattern). This explains why a strong electric field in 'empty space' creates a stream of positrons and electrons. (I actually deduced this then checked - it is true.) This also means physics understanding of the energy of matter and space is incomplete / wrong, it is missing this underlying wave energy of space that creates both matter 'particles' and their 'fields'. Thus modern physics thinks that particle / anti-particle pair production contradicts conservation of energy laws (since matter and anti matter both have positive energy) so they cheat and use the uncertainty principle to avoid this (search pair production in wikipedia). The solution, the pair production is just the plane waves changing their phase arrangements such that space changes from a field vibration pattern to two particle vibration patterns (spherical standing waves). Both wave patterns have the same energy - it is just distributed in different directions / wave patterns. The Very Famous Dirac Equation of Matter and Fields (the Universe) is Explained! From the above plane wave formalism in 3D space the quaternion wave equation you get is a general form of the Dirac equation - and this is really the equation of the universe as it connects the 'field' to the 'particle' - all from intersecting plane waves in space. Dirac found the solution mathematically by factorizing the energy equation of matter (Klein Gordon equation) into its component parts, whereas we have deduced it from first principles of plane waves in space. Despite the errors one must also marvel at how much mathematical analysis was done on the tiny details of matter without ever understanding it. But now any sensible logical person can simply understand and visualize physical reality - and most importantly, you can deduce all the central equations of modern physics (Einstein's relativity and quantum physics) using three dimensional quaternion wave equations. This has already been done - I have just provided the physical meaning of the equations which no one else seems to have yet realised. "If quaternions are used consistently in theoretical physics, we get a complete description of the physical world, with relativistic and quantum effects easily taken into account. Thus Hamilton’s idea, which motivated more then half of his professional life, that quaternions are a fundamental building block of the physical universe, appears to be essentially correct in the light of contemporary knowledge." Basically stated, once you have the correct three dimensional mathematical structure for describing real plane waves in real three dimensional space, you find that you can deduce all the main equations of modern physics. i.e. We now have a complete metaphysical / scientific theory that deduces all of quantum physics and Einstein's relativity with the complete mathematics already done. I have just provided the final piece of the puzzle, the connection of quaternion maths to real complex plane waves in three dimensional space that form real scalar spherical standing waves and their wave-center 'particles'. I am well aware of postmodernism and its dangerously destructive conclusion (to reason, science and society) that we are trapped in the mind and can never know the thing in itself (see Kant), thus metaphysics is meaningless, all knowledge is uncertain, merely cultural human constructs, logical positivist tools for thinking. Most significantly, metaphysics, this awareness of the dynamic unity of reality, was central to the emergence of reason and philosophy, the arts and sciences, thus it is correct and long overdue to re-unite this with science. And here we see the cause of all the confusion - Newton's mechanics had a metaphysics of space and time to which he must add discrete 'particles' with mass and 'magical' forces to connect them (action-at-a-distance). This was always just a mathematical solution which never explained how matter was connected across the universe. By describing reality most simply, in terms of waves is space, we now understand how 'particles' can appear in this space as discrete things, yet in reality are connected across the universe by their in and out waves (plane waves). Is this a complete theory of everything (TOE)? What is the Nature of God? No. I do not believe that is possible. This is a description of physical reality, i.e. wave energy interactions in space, how this explains matter. But science says nothing about how our minds can convert sense data based on wave patterns into feelings of love and hate, good and bad, pleasure and pain, tastes and colors, all the higher sensual, emotional and moral representations of our minds. We know these things exist because we all personally experience them. To me this is the religious spiritual side of human existence, where God is the total properties of space (God is not separate from the world, God and nature are one - thus we have moved from Newton and God's particles to God's space or Godspace). We find this connected harmony of a dynamic unity of reality (God, Brahman, Tao, Spirit, Energy, Light, Vibration) is central to all major world religions, thus their common, and very important moral foundation of 'Do unto others as to thyself'. This is true - the other is part of the self! To me this is all we need to know to live kindly with one another, with all life on Earth. Please Help Humanity by Sharing this Knowledge. From this most simple foundation of plane waves in space naturally creating two different modes of vibration - spherical particle vibrations and complex field vibrations - we can now deduce all of modern physics. However, the complexity that evolves from this simple dynamic wave system is extraordinary, as is required to explain how such amazing life can exist in the universe. Most importantly, we can see why evolution (change) and ecology (interconnection) are true as they are properties of physical reality. Over billions of years this evolution and ecology of matter waves in the universe has evolved levels of complexity far beyond the comprehension of our feeble minds. For some perspective - there are a trillion trillion wave-center 'particles' in a pin head, all vibrating 10^20 times per second with 10^80 other wave-center 'particles' in the universe - mind boggling! The problem for humanity is that our human civilization is also a very complexly evolved wave structure of the universe that is beyond our comprehension, and now clearly in great trouble due to human overpopulation and the resultant destruction of Nature, climate change and the pollution of air, land and water. Basically, our current global system functions in a very destructive dysfunctional manner simply because it is founded on past myths and customs, these are not true thus they cause us harm. And there is only once solution - to understand the truth about our existence in the universe so that we can think and act wisely. And one central wisdom - life on earth is far too complex to be regulated or recklessly exploited (GMO), it must be allowed to function naturally or it will collapse, wiping out much of our civilization and causing the deaths of billions (our children). Given the Censorship in Physics / Philosophy of Science Journals (founded on the standard model / particle physics) the internet is clearly the best way to get new knowledge visible to the world. A world now in great need of wisdom from truth and reality. This knowledge of the Wave Structure of Matter in Space provides us with a 'source code' from which we can deduce the truth as a foundation for acting wisely. Clearly humanity now faces many problems caused by myths and customs that result in endless conflict and harm. Thus knowing the truth about physical reality is critically important for our future survival on our fragile and beautiful little planet. Basically I hope to make it obvious to people that are either sensible and logical, or enlightened spiritual / religious that we have worked out physical reality (matter-energy interactions in space). To show you that we can perfectly imagine matter interactions in space - they are just wave interactions. Then you will understand that this whole postmodern uncertainty and skepticism arose from trying to describe an interconnected reality (where matter is a large structure of space) with many discrete and separate particles. Please help share this knowledge. Our existence in the universe is amazing, our bodies subtly connected to all this other matter in the space around us (this is why we can see and interact with it). Currently humanity does not live from these 'connected' foundations, and this 'insanity' is causing the destruction of life on earth that will have catastrophic consequences for all of us. The cure is a correct understanding of physical reality and the necessary truths that are derived from this. There are many others who now realise this, that truth is the most powerful force for changing the world and saving humanity. If you want to discuss things then please use Facebook. "The Truth is far more powerful than any weapon of mass destruction." The following articles have been re-written recently. They are the most important / useful pages for understanding how the WSM works, why I am convinced it is true. A Letter to Philosophers, Physicists, Scientists ... It is an open letter to philosophers and scientists explaining a remarkable discovery I have only recently stumbled upon. If you describe reality most simply, from just plane waves flowing through space in all directions, you find that space vibrates in two different ways that correspond to the quantum field and the particle. You can then deduce the Dirac equation (using complex quaternion wave functions) and from this foundation you can then deduce all the main equations of modern physics. It is simple, yet it evolves amazing complexity! Quaternions - My journey through quaternions, some observations, some questions. So if you like maths then read it, get involved, help. It is fascinating, it is profound! "Time is said to have only one dimension, and space to have three dimensions. ... The mathematical quaternion partakes of both these elements; in technical language it may be said to be 'time plus space', or 'space plus time': and in this sense it has, or at least involves a reference to, four dimensions. And how the One of Time, of Space the Three, Might in the Chain of Symbols girdled be." (Note) This knowledge of quaternions has not been incorporated into the site yet - there is a lot more knowledge that can be now added, a few errors that need correction. Theology God Religion - Defining god in terms of the one infinite eternal substance that exists. Free Will Vs. Determinism - How we can have limited freedom and limited determinism in a necessarily interconnected reality of waves in space. The central point to emphasise is that the solution is deduced using the accepted rules of science - most importantly Occam's Razor / Principle of Simplicity and Metaphysics / Dynamic Unity of Reality. This forces us to describe reality in terms of one substance, Space, and its wave motions that form matter (no opinions). It is also a significant fact that there is not another page on the internet that considers what the most simple science theory of reality is - which is strange given Occam's Razor (principle of simplicity) is fundamental to science. Thus it seems premature to claim science does not really work (the logical positivist / social construct view of postmodern science) without having considered this most simple solution (which is actually very obvious once known!). When we see things as being separate and discrete (like the human body) this is an illusion (naive real). In Reality matter (and thus all people) are wave structures of the universe, vibrating / resonating with everything in the Space around you. We are all subtly interconnected to all other matter in the observable universe because we are universal creatures (which is why we can see those stars spread across the universe, because we are a part of them, they a part of us). Thus seeing our bodies as discrete and separate objects is an an illusion of our limited senses (as representations of the mind). This is the enlightenment that mystics / spiritualists and great scientists like Albert Einstein realised. 3. To Solve the Central Problems of Knowledge. By understanding matter's (our) true spatially extended nature we can easily understand the necessary connection between things existing in space (imagine spherical waves in space flowing through one another). This explains how the Earth can orbit the Sun, how we can see the Stars in the night sky, i.e. these 'forces of light and gravity' that extend across the observable universe. From this knowledge of necessary connection we can then solve the problems of science, of physics, logic and mathematics, philosophy, metaphysics, theology and our evolution and ecology. (There are many problems to explain, caused by the current discrete particle conception of matter, as modern academia well realises). This is one of the wonderful things about the Internet. People can be free individuals and yet also work together on the Internet to correct past errors both in human knowledge and in human society - and thus contribute to a better future for Humanity. True knowledge of reality has the potential to save humanity from disaster - but it achieves nothing unless people are aware of it - and that is something that depends on you (the best we can do is to present this knowledge as simply, concisely and clearly as we can - the pages are getting better, we are working hard!). Navigation: The main subject pages are listed at the side of each page - the site maps (by subject) are at the bottom of each page. Hope you enjoy browsing around - and thinking about your existence in the universe!